Bron: Nutr Cancer. 2015;67(3):457-62. doi: 10.1080/01635581.2015.1004734. Epub 2015 Mar 24. Hoe simpel kan het soms zijn. Operaties in het gebied rondom de alvleesklier zijn vaak heel riskant en kunnen voor zeer ernstige complicaties zorgen. Vaak overlijden mensen tijdens of ten gevolge van de operatie met name door infecties. Uit een placebo gecontroleerde gerandomiseerde studie met patienten die werden geopereerd aan een zogeheten Periampullary neoplasms (kwaadaardige tumoren rondom de overgang van alvleesklier en maag) blijkt dat wanneer patienten in de weken voor de operatie voor totaal 14 dagen 2x per dag een mix namen van probiotica en synbiotica dan bleken deze patienten veel beter beschermd tegen ernstige complicaties. Wat heet beter beschermd. Uit de groep van 23 patiënten die een placebo kregen overleden 6 patiënten (= 25%) tijdens of kort daarop aan de gevolgen van de operatie, ten gevolge van infecties. Van de 23 patienten die synbiotica hadden gekregen overleed niemand. De synbiotica bestond uit Lactobacillus acidophilus 10, 1 × 10(9)CFU, Lactobacillus rhamnosus HS 111, 1 × 10(9) CFU, Lactobacillus casei 10, 1 × 10(9) CFU, Bifidobacterium bifidum, 1 × 10(9)CFU, en fructooligosaccharides (FOS) 100 mg.
Dat probiotica en synbiotica vooraf aan operaties in met name de spijsverteringsorganen ernstige complicaties kan tegengaan is al veel langer bekend. Zie o.a. dit studierapport: Perioperative Synbiotic Treatment to Prevent Postoperative Infectious Complications in Biliary Cancer Surgery gratis in te zien: met een referentielijst die veel meer studies vermeld rondom dit onderwerp. Referentielijst van deze studie staat onderaan dit artikel Maar ik vermoed dat dit in veel ziekenhuizen niet zal worden toegepast. Waarom toch niet. Het is toch eigenlijk heel simpel en spotgoedkoop en voorkomt zeer ernstig leed voor de patienten. Het volledige studierapport: Perioperative synbiotics decrease postoperative complications in periampullary neoplasms: a randomized, double-blind clinical trial is tegen betaling in te zien. Nutr Cancer. 2015;67(3):457-62. doi: 10.1080/01635581.2015.1004734. Epub 2015 Mar 24. Perioperative synbiotics decrease postoperative complications in periampullary neoplasms: a randomized, double-blind clinical trial. Sommacal HM1, Bersch VP, Vitola SP, Osvaldt AB. 1a Post Graduate Program in Medicine - Surgical Sciences , Universidade Federal do Rio Grande do Sul School of Medicine , Porto Alegre , Brazil. Periampullary neoplasms are rapidly progressive tumors with a poor prognosis and high morbidity and mortality rates, which have a negative influence on patient outcomes. Some probiotics and prebiotics have the ability to protect the intestinal barrier and prevent bacterial translocation, infection, and postoperative complications. We evaluated the use of synbiotics in a prospective, double-blind study of patients undergoing surgery for periampullary neoplasms (PNs) and assessed the effect of these agents on nutritional status, postoperative complications, antibiotic use, length of hospital stay, and mortality. 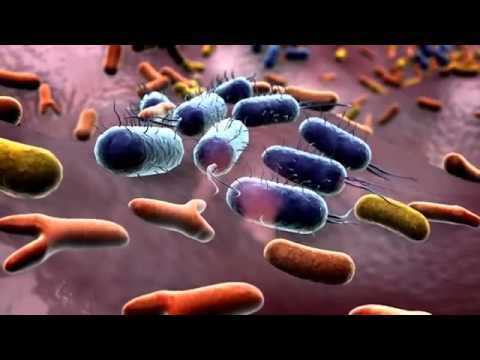 Patients were randomized to receive probiotics and prebiotics-synbiotics--group S [Lactobacillus acidophilus 10, 1 × 10(9)CFU, Lactobacillus rhamnosus HS 111, 1 × 10(9) CFU, Lactobacillus casei 10, 1 × 10(9) CFU, Bifidobacterium bifidum, 1 × 10(9)CFU, and fructooligosaccharides (FOS) 100 mg]--or placebo-controls--group C, twice daily, for a total of 14 days. Risk, clinical status, and postoperative complication rates were assessed. Twenty-three patients were allocated to each group. The incidence of postoperative infection was significantly lower in group S (6 of 23 patients, 26.1%) than in group C (16 of 23 patients, 69.6%) (P = 0.00). Duration of antibiotic therapy was also shorter in group S (mean = 9 days vs. 15 days in group C; P = 0.01). Noninfectious complications were less common in group S (6 of 23 vs. 14 of 23 patients in group C; P = 0.03). Mean length of hospital stay was 12 ± 5 days in group S vs. 23 ± 14 days in group C (P = 0.00). No deaths occurred in group S, whereas 6 deaths occurred in group C (P = 0.02). Perioperative administration of synbiotics reduces postoperative mortality and complication rates in patients undergoing surgery for PNs. 32. Azuma R, Suto T. Validity of transfer of the taxonomical position of Corynebacterium pseudopyogenes from genus Corynebacterium to genus Actinomyces. In: Izuka H, Hasegawa T, eds. Proceeding of the First International Conference on Culture Collection. Tokyo: University of Tokyo, 1970:493–505. 35. Sonoike K, Mada M, Mutai M. Selective agar medium for counting viable cells of bifidobacteria in fermented milk. J Food Hyg Soc Jpn. 1986;27:238–244. 37. Kikuchi H, Yajima T. Correlation between water-holding capacity of different types of cellulose in vitro and gastrointestinal retention time in vivo of rats. J Sci Food Agr. 1992;60:139–146. 53. Mitsuoka T. Significance of dietary modulation of intestinal flora and intestinal enviroment. Biosci Microflora. 2000;19:15–25. 54. Sakata T. Effect of short-chain fatty acids on the proliferation of gut epithelial cells in vivo. In: Cummings J, Rombeau J, Sakata T, eds. Physiological and Clinical Aspects of Short-Chain Fatty Acids. Cambridge: Cambridge University Press, 1995:191–208. 55. Cherbut C. Effects of short-chain fatty acids on gastrointestinal motility. In: Cummings J, Rombeau J, Sakata T, eds. Physiological and Clinical Aspects of Short-Chain Fatty Acids. Cambridge: Cambridge University Press, 1995:191–208. Reageer op "Synbiotica pre operatief voorkomt hoog significant ernstige complicaties bij operaties in gebied van alvleesklier. 6 versus geen sterfgevallen tijdens operatie"